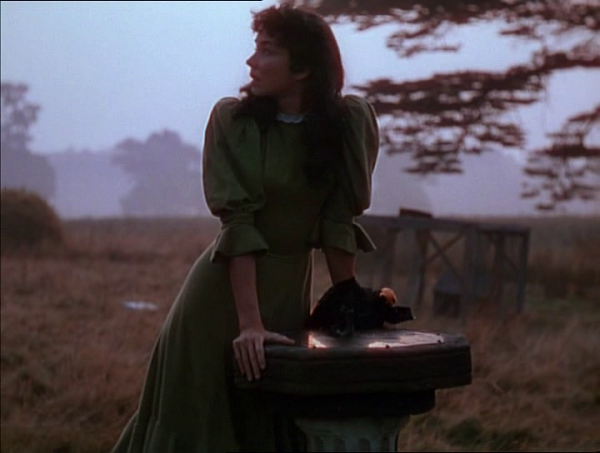 In 1897, the earthy, animal-loving Hazel Woodus (Jennifer Jones) lives in the Shropshire countryside with her father Abel (Esmond Knight), a coffin-maker and harpist, and her beloved pet fox Foxy. Her mother has passed away, but not without passing along a belief in pagan superstition. One night while walking home, fearing the “Dark Huntsmen”, she is startled by the carriage of squire Jack Reddin (David Farrar). Reddin takes her to his estate and makes advances on her. She escapes and Reddin spends days searching for her. Meanwhile, she’s captured the attention of the gentle minister Edward Marston (Cyril Cusack), who is captivated by her angelic singing at a local fair. Marston, swearing an oath to God to protect her, proposes. Hazel, having sworn her own oath to marry the first one that asks, accepts. But when Reddin finally catches up with her, he has his own ideas. This film came at the end of Powell and Pressburger’s peak period, a string of films that included A Matter of Life and Death, Black Narcissus, and The Red Shoes. For this one, they worked with producer David O. Selznick (Jones’s husband), who was unsatisfied with the results and ultimately butchered the movie and released it as The Wild Heart in the U.S. Fortunately, I watched the original version, which is a somewhat routine melodrama but retains the mysterious charm of the Archers. The quiet eeriness mixed with the rustic country life gives it the air of a fairy tale. The analogy of Hazel and the fox — an untamed but innocent creature — is perhaps a bit obvious, but is handled with gorgeous grace. Innocents are dogged and persecuted by social mores (especially in a Victorian era)… the expectation that lower classes should submit to the wealthy and powerful, the wagging tongues of those who would make private affairs public gossip, the double-standard when it comes to women and their desires. It’s interesting that each of the three principals in the story has an older figure in their lives, each serving a different role. Marston’s mother (Sybil Thorndike) is protective… not of her son or his wishes, but protective of the family reputation, prudishly attempting to shield it from any hint of impropriety. Hazel’s father is a bit of a scamp and has a somewhat antagonistic relationship with her, but he clings to a sort of folksy set of ethics that show a true fatherly concern. And Reddin’s manservant Vessons (Hugh Griffith) seems mostly concerned with protecting the world from his master’s lechery. These figures are, no matter what their intentions, ultimately unsuccessful at controlling their wards, as one generation gives way to the next. Nature — human and animal — wins out. This entry was posted on March 22, 2015 at 3:06 pm	and is filed under Movie Reviews. You can follow any responses to this entry through the RSS 2.0 feed. You can leave a response, or trackback from your own site. This little known/seen film is one of the Jennifer Jones vehicles that present her in the way I first saw her as a child on English TV and found her quite fascinating. The other films are “Portrait of Jennie”, and “Love Letters”. These 3 movies allow a limps of a somewhat eerily attractive, but glowing actress. Not one of the major stars remembered by Hollywood, and often thought to have been mis-handled by her obsessed husband, Selznick. She has a few interesting roles, “Duel in The Sun’ particular the ending, “Cluny Brown” “Carrie”, “tender Is The Night’ and “Madame Bovary” are some of the most notable ones. her last appearance in the Epic ‘Towering Inferno’, gave her the only decent female role in the movie. Her performances are marked as being sometimes overly mannered. Most well-known for her Oscar winning “Song of Bernadette. An elusive performer due to her shyness and discomfort with the Hollywood routine. David Farrar , little known in American- but effective in Michael Powell’s great Black Narcissus, is not a sympathetic actor. Reviews of Jones’s accent are mixed, I think I read somewhere that Powell, was very happy with it’s accuracy. She seems to forget the accent sometimes. In the beginning she doesn’t appear to be doing one at all. I’ve seen some of the other titles you listed (Jennie, Duel, Inferno) and a few others and I’ve just never been impressed. Gone to Earth is the best I’ve seen her.